was launched near Brisbane today. drivers safer, with the inclusion of a panic alarm. "The other thing that is really important is an emergency button built in so if the driver is under attack he can hit the button and then the operational staff’s map zooms into that bus, it flashes red and they know there is an emergency on that bus," Rowell says. "It is huge for these operators as drivers can call for help discreetly." The Translink initiative is part of a trial involving, first, Clarks Logan City buses from mid-2012 to mid-2013, then CityGlider buses from late-2012 to mid-2013. As part of the trial, satellite tracking equipment will be fitted to 120 Clarks Logan City buses and 20 CityGlider buses. Onboard electronic passenger information displays (PIDs) and audio announcements will be provided on the buses and Kerbside PIDs have been installed at Logan Hyperdome, Springwood, and Beenleigh stations. Rowell says passengers will also be able to access real-time bus travel information online and with smart phones. "At selected stops you’ve got the information displays so that passengers know when buses will arrive and also Translink has a website that links into our system," Rowell says. "So any stop that these buses service you can call it up on the Translink website and it will say for example the next bus is in three minutes. "Basically what that means for passengers is when they make a decision about what to do they don’t have to come down to the bus stop wondering if the bus is on time or running late. if the bus is running late." 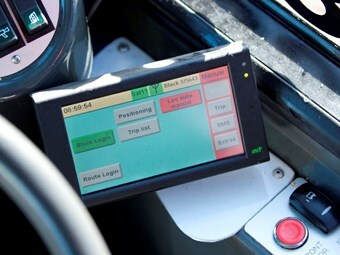 Each bus involved in the trial will have an onboard computer and GPS. Rowell says by measuring the buses odometer pulses and using historical traffic data, the system can make very accurate bus arrival predictions. "The onboard computer will use that information with historical data so it will calculate how long it is going to take to get to a stop based on whether it is Monday morning peak hour or a Sunday afternoon," Rowelll says. "And if something unforseen happens, like a traffic accident, the system realises and it adjusts its prediction." Transport Minister Scott Emerson, who caught a Clarks Logan City bus to the launch, says he hopes to see the technology eventually rolled out across southeast Queensland. "My vision is really for the whole southeast Queensland network – that is what we want to do," Emerson says. "There are so many benefits including some things that people aren’t necessarily aware of, say for instance, this system allows operators to do stress alarms."